MyMovieMonsters.com > Scary Monsters Gear & T-Shirts! 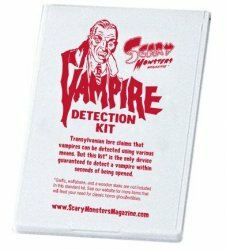 > Scary Monsters Vampire Detection Kit! This pocket-sized kit is sure to help in identifying potential blood-sucking candidates! 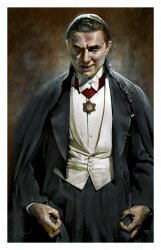 Transylvanian lore claims that vampires can be detected using various means. But this kit* is the only device guaranteed to detect a vampire within seconds of being opened. *Garlic, wolfsbane, and a wooden stake are not included in this standard kit.